A blog site for Camera Obscura Records, an indie record label out of Australia trading in new psychedelia and other sonic indulgences. Established in 1996, and still shambling along, reason thrown to the winds. We follow up Christian Kiefer's critically acclaimed albums on Camera Obscura ("Czar Nicholas is Dead") and Undertow ("Dogs and Donkeys") with Christian's new and very accessible song-based collaboration with fellow traveler Jefferson Pitcher. The official release date is 02 October, but as usual we offer you, our beloved MySpace customers, the option to purchase from now, well in advance of the street date. The slow shifting hiss of the surf fades. The footsteps of men stumble across the beach rock; a tottering over, facedown. Waves on the stones further out: black, now green, now shadow again. Somewhere, so far under the surface that only the bleakest fish run their dark gunnels: ships rest their masts. Crabs like spiders spin homes in the maw of rock-smashed hull and keel. 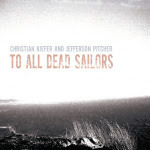 It is upon such images that Christian Kiefer and Jefferson Pitcher have built "To All Dead Sailors". A collection of songs, instrumentals, and sonic experiments, this is an album that explores the mystery of the sea: its violence, its beauty, its grace. Through it all, the album tells the story of the men who have chosen a life, and ultimately a death, in its vast expanses. From the story of a haggard submarine captain disgraced amongst his countrymen, to the lonely sound of the ship's engine room, to the tale (borrowed from Pablo Neruda) of a mermaid wandering up onto dry land and into a world she could not have imagined, these are songs and sounds that envelop the listener in a long rumination on things of the sea. Merging songs with more experimental sounds has long been of interest to both musicians. Pitcher developed his experimental performance as a member of Tintinambulate, a free-improv workshop based in upstate New York and featuring legendary avant-garde musician Pauline Oliveros. His previous albums, including the superb ambient song cycle "I am Not in Spain" (Mudita/Moonpalace), move between songs and sonic textures, displaying his ongoing interest in using sound to create a particular sonic space or location. Pitcher's work is mirrored in Kiefer's, who has a long history of alternating between song and experimental forms, including his recent albums "Czar Nicholas Is Dead" (a mostly-instrumental look at the Russian Revolution on Camera Obscura) and Dogs & Donkeys (a song-based narrative on Undertow). Listeners may remember Kiefer and Pitcher's previous collaboration: "The Inexplicable Falling" (Mudita), a split full-length CD with Pitcher fronting the now defunct orchestral indie-rock band Above the Orange Trees. Unlike that album, "To All Dead Sailors" is a collaborative project, with the singers trading harmonies and instruments on various tracks, and working through various songwriting ideas as they floated to the surface. Acoustic and electric instruments are combined with field recordings to create a finished project that is reminiscent of Brian Eno's ambient projects, the moody soundscapes of Sigur Rós, and the song-based work of Califone, Xiu Xiu, and Damien Rice. Go to: the Camera Obscura web site to purchase on-line via Paypal. other currency than AU$ add the equivalent of US$7.00 for exchange fee. Paypal (use the US$ option), Direct Debit, Bank Deposit. Christian Kiefer and Jefferson Pitcher Collaborate For Upcoming Camera Obscura CD! Conceptual collaboration between Kiefer and Pitcher. It's a collection of songs, textures, and field recordings related to the sea, seafaring, death, and beauty, and connects to the song-based side of both artists work; exemplified by "Medicine Show" and "Welcome to Hard Times" on Extreme Records, and their split CD from 2002 "The Inexplicable Falling". Release notes can be found here. Links to MP3s can be found here. 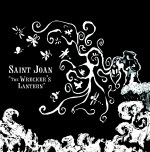 Saintly Press For "The Wrecker's Lantern"
United Bible Studies CD Out Now! Rusalnaia CD Now Available for Mail Order! Linus Pauling Quartet LP Out Soon!